Colonel Chris Hadfield is a retired Canadian astronaut who was the first Canadian to walk in space. “Good morning, Earth!” That is how Colonel Chris Hadfield—writing on Twitter—woke up the world every day while living for five months aboard the International Space Station. Through his 21-years as an astronaut, three spaceflights, and 2600 orbits of Earth, Colonel Hadfield has become a worldwide sensation, harnessing the power of social media to make outer space accessible to millions and infusing a sense of wonder into our collective consciousness not felt since humanity first walked on the Moon. Called “the most famous astronaut since Neil Armstrong,” Colonel Hadfield continues to bring the marvels of science and space travel to everyone he encounters. 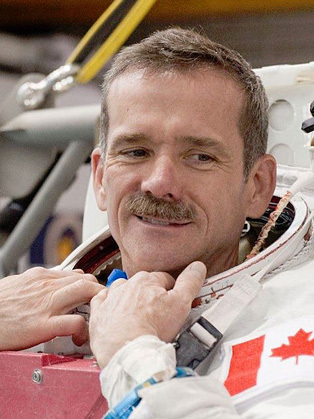 Colonel Chris Hadfield is a pioneer of many historic “firsts”. In 1992, he was selected by the Canadian Space Agency as a NASA Mission Specialist—Canada’s first fully-qualified Space Shuttle crew member. Three years later, aboard Shuttle Atlantis, he was the first Canadian to operate the Canadarm in space, and the first Canadian to board a Russian spacecraft as he helped build space station “Mir.” In 2001, aboard Shuttle Endeavour, Colonel Hadfield performed two spacewalks—the first Canadian to do so—and, in 2013, he was Commander of the International Space Station—the first and only Canadian to ever command a spaceship—so far.